Not long ago, the choice of a portable computer was restricted to a traditional laptop. However, as time went by, powerful operating systems and mobile processors were introduced into the market. This widened the choice for end users to include tablets as convenient alternatives. Due to the limited functionality of tablets and the inconvenience of a laptop, manufacturers saw the opportunity of merging the two devices to create 2-in-1 laptops. A 2-in-1 refers to a detachable hybrid tablet or convertible hybrid laptop that comes with both a keyboard and a touchscreen. This flexibility allows you to seamlessly flip between the laptop and tablet modes. Much like their traditional counterparts, the best 2-in-1 laptops come with an operating system which is either Windows or Chrome OS. To understand 2-in-1 devices better, you have to group them into two categories: detachable hybrid tablets and convertible laptops. This is a slate tablet with a keyboard dock or case. For stability, the keyboard dock is preferred to the keyboard case. If you desire optimal mobility and portability, you can leave the keyboard part behind and operate with the tablet alone. It is not uncommon to find best detachable laptops weighing less than 3 pounds, together with the keyboard dock. Apart from the extra functionality keyboard docks provide, they may also include USB ports and extra battery cells to give you more power to work off-plug. Instead of detaching the keypad, this type of 2-in-1 laptops uses a folding design to transform from tablet to laptop and vice versa. If you are a frequent user of the keyboard for input, this is the best type for you. Thanks to the folding mechanism and the range of motion it gives, you can opt for different modes based on use. For instance, you can share your display with other participants in a meeting by using a stand mode. You can also prop it up in tent mode if you do not have much space. The flexibility of this 2-in-1 laptop type is unbeatable. The motherboard and battery system are located at the base much like in a conventional laptop. This gives the device stability when typing on a platform such as tabletop or lap. The relatively larger room for batteries provides enhanced battery life. Generally, 2-in-1 laptops use mobile processors which are relatively less powerful compared to traditional laptops of the same size. The mobile processors are specifically designed to allow for quiet, cool operation instead of blazing speeds. Chances are high that you will be working on your laptop for longer hours. Because of this, it is imperative that eyes stay comfortable and stress-free. The element that takes care of this in your laptop is the display. It should be clear, with the right amount of brightness and minimal flicker to allow you to stay productive for longer. In the spirit of mobile workforce productivity, your 2-in-1 laptop must intuitively blend portability and performance. The key elements for maximum performance include immersive graphics, powerful processors, long battery life, adequate RAM, and a larger display. Look at the number of cells in the battery system and whether the laptop allows you to incorporate external swappable batteries. This will give you extended hours of battery life. Check the charge option the laptop comes with. Some of the modern 2-in-1 laptops have a rapid charge option that lets you charge your laptop in a much shorter time. The build of your laptop determines its durability. 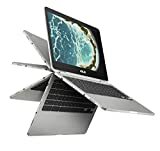 Due to the nature of their assignments, 2-in-1 laptops should withstand everyday drops and bumps as well as survive the vagaries of remote working such as temperature differentials. Some 2-in-1 laptops use a top cover consisting of a carbon fiber foam sandwiched between two carbon fiber layers. This gives you a lighter, stronger, and much thinner device. To minimize the failure rate and allow for better cooling, your device should provide an increased air flow. As with anything else, shopping for 2-in-1 laptops involves compromises and trade-offs. Our reviews below will help you decide the laptop that best suits your needs. This is one of the best detachable laptops on the market. It gives you up to 17 hours of battery life and 13.5-inch PixelSense Display. With a resolution of up to 3240 x 2160, you will enjoy clean, crisp, and sharp images. Microsoft Surface Book 2 comes with either Intel Core i5 or i7 processor. In terms of storage, you can choose from 256GB to 1 TB SSD. In today’s day and age, when work is no longer something we do in an office, a device like the Spectre x360-13t is a necessity. The thin, lightweight 2-in-1 design and durable chassis make it perfect for traveling and working on the go. With a battery that lasts for about 16+ hours and the 8th Gen Intel i7-8550U Quad-core processor running the show, the device delivers high-end performance. The Specter is equipped with 16GB DDR4 RAM and 512GB PCIe NVMe SSD for data storage. Furthermore, the 13.3-inch FHD IPS micro-edge touchscreen is perfect for all sorts of office-related activities. Not to mention, the 1920 x 1080 pixels touchscreen is protected by Corning Gorilla Glass. The device also comes with a digital pen, so you can take notes, make sketches, and use it for various editing operations. To make sure all your data is protected, the x360-13t is fitted with an IR camera and safe payment with a fingerprint reader. This way, in case it gets lost or stolen, no one can use your data. Finally, the Specter x360-13t also comes with expertly tuned Bang & Olufsen speakers, supports WiFi and Bluetooth 4.2 connectivity and has one USB 3.1 port. Embodying the 8th generation Intel quad-core, this ultrabook is among the fastest. Much like the Yoga 910, this machine weighs 3.02 pounds and has an integrated Intel HD 620 graphics. The 13.9-inch IPS display gives you solid viewing angles. The RAM and storage are enough for the majority of tasks at 16 GB DDR4 and 512 GB SSD. For connectivity, you have Bluetooth 4.1, a port that supports Thunderbolt 3, and headset jack. This is a midrange 2-in-1 laptop with a solid Intel Dual-Core i7-7500U processor and a 13.3-inch touch display to go along with. This 3.2-pound convertible also has a 16 GB DDR4 RAM and a 512 GB SSD. The stealth silver shell looks professional and solid. The keyboard boasts of concave keys together with hotkeys that allow you to juggle your external monitor as well as toggle on and off the speakers, trackpad, and Wi-Fi. In terms of ports, this machine has a full HDMI port, USB 3.1, USB 3.0, and USB 2.0. Google Pixelbook comes with an Intel i5, 128 GB SSD and 8 GB RAM. The touchscreen measures 12.3 inches and has a 2400 x 1600-pixel resolution. In addition to the headphone jack, this 2.4-pound laptop has two USB-C ports. With just the right mix of a soft and mechanical keyboard, this is not only one of the best Chromebooks, but also an enjoyable device to use. The ZenBook Flip 14 from Asus is a masterpiece! The first thing you’ll notice is the ultra-elegant design that features an aluminum case with the spun-metal finish specific for Asus devices. Furthermore, the device is ultra-thin (0.5 inches) and light (3.1 lbs. ), which makes it amazing for traveling. The 360-degree flappable touchscreen is perfect for those moments when you want to browse, and the keyboard and Pen are great for when you need to work. The 14-inch 10-point touchscreen features a wide-view FHD resolution, with a nano-edge bezel that protects the screen without limiting the view. Under its elegant case, the ZenBook hides a powerful engine, fueled by an Intel Core i5-8250U Quad-core Processor with 6M Cache that can go up to 3.40 GHz. All this processing power is used to support 8GB LPDDR3 RAM running at 2133MHz and one 256GB SATA SSD. Also, the battery will last for about 13 hours, and it charges at 60% in just 50 minutes, due to fast charge technology. Furthermore, you won’t have to remember any passwords due to the built-in fingerprint reader in the touchpad that’s compatible with Windows Hello feature. Finally, the device supports 802.11a/c WiFi networks and has HDMI/USB Type C ports with an integrated SD card reader. This 2-in-1 laptop has a sharp 15-inch 4K screen display and a powerful aluminum build. The processor is an 8th Gen Intel core and it’s complemented by MX150 Nvidia’s graphics chip. This gives you amazing speeds. The keyboard has a comfortable layout and crisp key action. The laptop also includes HDMI, DisplayPort, USB-A and USB-C ports. The hard drive size is 512GB and the RAM is a comfortable 16 GB. This 2-in-1 weighs 4.2 pounds. The Yoga 730 runs Windows 10 on a platform that’s powered by an 8th Gen Intel Core i5-8250U mobile processor with quad-core. This makes the device run smoothly, whether you’re just browsing or working on your latest report. Of course, the 8GB RAM memory and the SSD also have a word to say in this. The 15.6” FHD 10-point multitouch IPS screen displays high-quality images and videos due to the Intel UHD Graphics 620 card. Just like most 2-in-1 designs, the Yoga 370 supports a 360-degree flip-and-fold design which allows four different viewing modes (laptop, tent, stand, and tablet). In terms of connectivity, the device supports HDMI, next-generation wireless-AC networks and has a Thunderbolt port. Finally, there’s a built-in HD webcam with dual-array microphone and a fingerprint reader, to keep any prying eyes away from your private information. 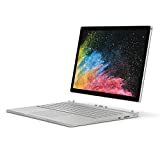 The Surface series is one of the most popular when it comes to devices that provide power and portability in the same package. The Surface Go is the smallest available, at a 10-inch diagonal and 1.15 lbs. weight, which makes it perfect for working, reading emails, or browsing your social media feed wherever you are. The tablet is equipped with an Intel Pentium Gold processor, 4GB of RAM memory, and 64GB eMMC or 128GB SSD (according to the version you choose). All this power allows you to run Windows 10 Home and Office apps, plus a wide range of other useful software. The high-res 10” PixelSense Display is perfect for images, videos, and supports 10-point multi-touch so you can work with the pen. It also gives users up to 9 hours of power and allows connectivity with other devices using the multi-tasking USB-C port and the headphone jack. 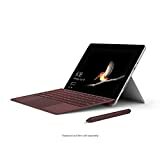 Keep in mind that the device doesn’t come with the Surface Go signature cover – you will have to purchase it separately. This sleek-looking laptop/tablet packs a lot of power under its thin aluminum case. There is an Intel Core with 64GB storage and 4GB RAM, to help you work at lightning speed. Furthermore, the device boots up in only 3.5 seconds, which is beyond impressive, and the battery will last for up to 10 hours. The design features a 360-degree hinge and a 12.5” FHD touchscreen with wide view panel and antiglare effect to reduce reflections and eye fatigue. This allows users to adapt the shape of the device as needed in order to work comfortably. Speaking of comfort, the keyboard was specially designed to provide a solid typing feel. Also, the touchpad is spacious and knows how to differentiate in between fingertip and palm contact (to avoid any accidents). 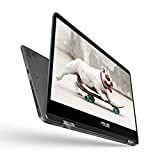 ASUS C302CA-DHM4 Chromebook Flip runs Chrome OS, which provides access to Google Play and Drive, two of the most sought-after software tools in today’s day and age. You also get to install a wide range of Android apps for work and relaxation. Finally, the laptop supports both 802.11ac Wi-Fi and Bluetooth 4.0 and comes with one USB 3.1 Type-C port, which can be used for charging and data transfer. Generally, 2-in-1 laptops are designed to give you the flexibility of a traditional laptop and the convenience of a tablet. Whether you go for the detachable or convertible laptop, you will find similarities in processor speeds, storage, builds, and other aspects. The best point to begin your search for the best 2-in-1 laptops is to analyze what you want to achieve with the machine and your budget. In this way, you will know the specifications to look out for and the range in terms of price.